Born in 1979; from an early age I had penchant for nature, I have seen many documentaries, animal guides and other books related to zoology which marked this vocation in my life. Spiders are the taxonomic group that I liked from the beginning. 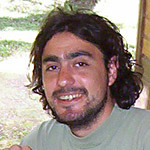 In 2005 I graduated as zoologist at the National University of the Northeast (UNNE), and then I joined the National Council for Scientific and Technical Research of Argentina (CONICET) with a scholarship. Since 2011 I am PhD in Biological Sciences at the National University of Córdoba (UNC), and for two years (2011/2012) I did my Postdoc at the Arachnology section of the Argentine Museum of Natural Science "Bernardino Rivadavia" (MACN). Along this path, my main taxonomy teachers were Gilberto Avalos, Luis Acosta, Martín Ramírez and Cristian Grismado who have taught me a lot about the spiders. Since 2013 I am a researcher of CONICET, and my workplace is the Institute of Subtropical Biology (IBS) in Misiones Province. In the early days my research line was on the Order Araneae, mainly taxonomy, ecology of communities, and geographical distribution patterns; nowadays my research interests are focused on family Salticidae, mainly taxonomy. I am developing the subject "Taxonomic studies, diversity and zoogeography of salticid spiders from Mesopotamia and Atlantic Forest of Misiones, northern Argentina".